Haha. Great. 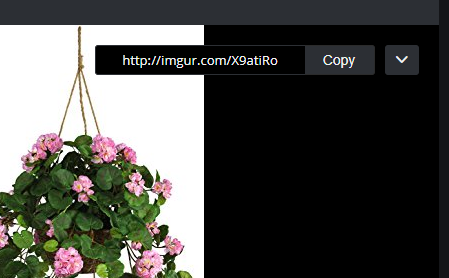 Thanks, you guys, for letting me know ... but then how did Batspiderfish identify my ants' species if he couldn't see the pictures in my ID request post either: http://forum.AntsCanada.com/viewtopic.php?f=48&t=4127? Jadeninja9 as well as AgdasHassaan were both kind enough to inform me that my photos were not showing up from Google Photos, so I have uploaded photos to an album on Imgur ... http://imgur.com/a/T9abm. Please let me know if there are still issues. Thanks! I can see them now clear as ever. Nice findings. Good Luck. So our tubing arrived earlier than we thought so we were able to introduce Queen #1 and #2 to their new foraging areas a day earlier than expected. 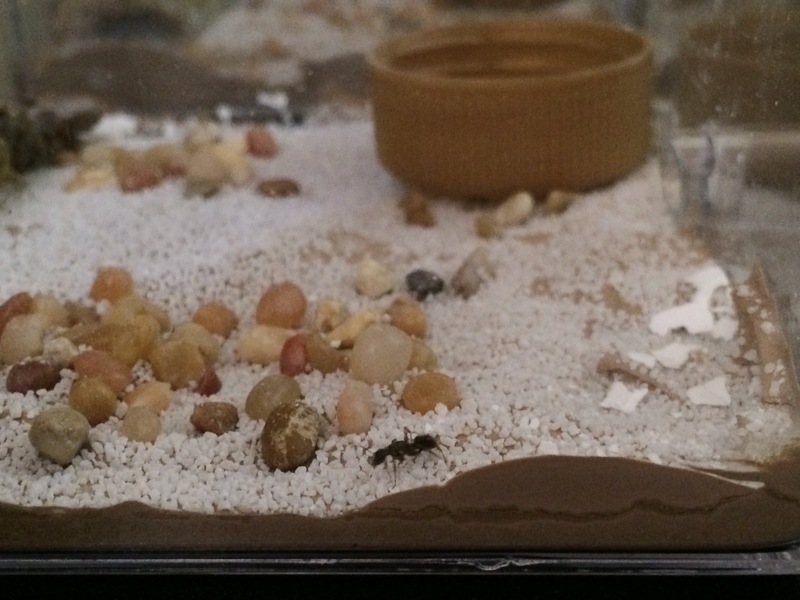 A worker from Queen#1's brood out exploring. 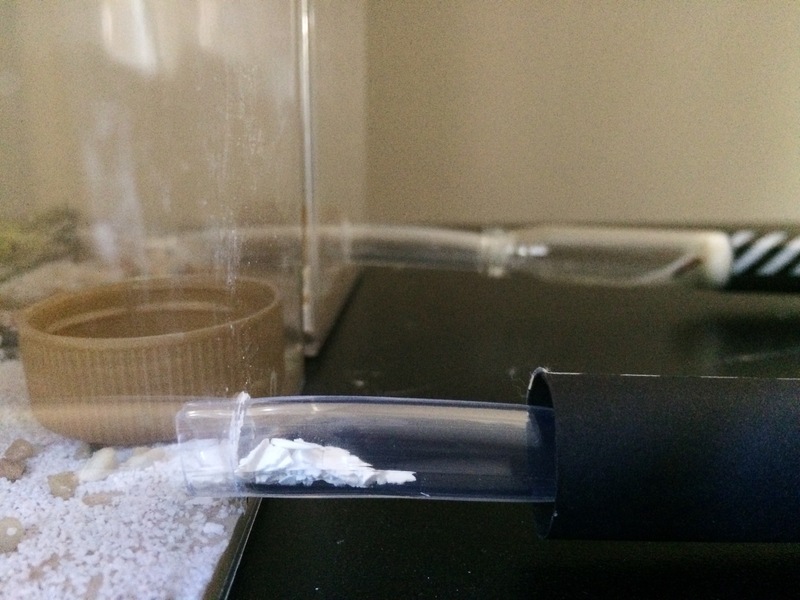 It only took them about ten minutes to leave the safety of the test tube. A worker from Queen #2'a brood went straight for the honey, instead. 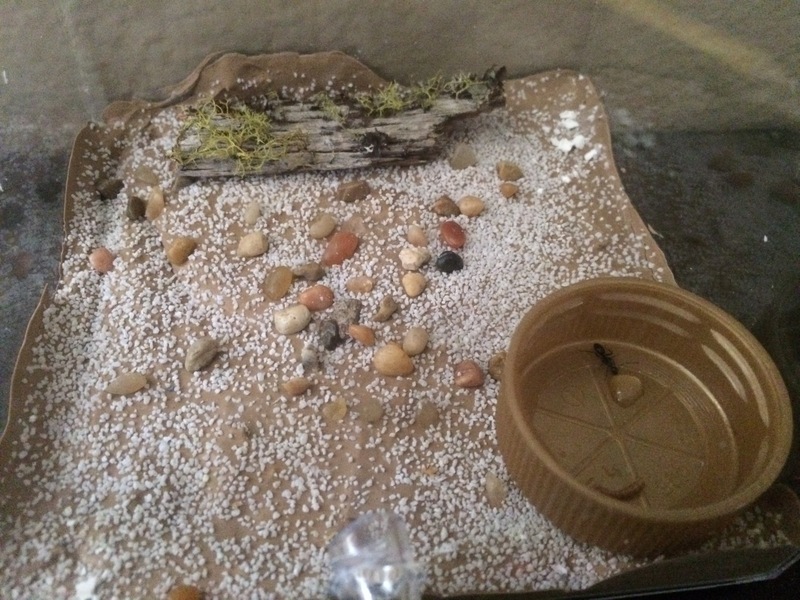 So I thought I'd post a quick supplies list of what we used to make our ants' foraging area. And lastly, the plant decorations we found on our property. They're twigs with wolf lichen on it. I soaked them in a 50/50 solution of 91% rubbing alcohol and water to hopefully kill any mites, parasites, etc. that might be on it and then let them dry for a couple of days. So a recap of the past week. 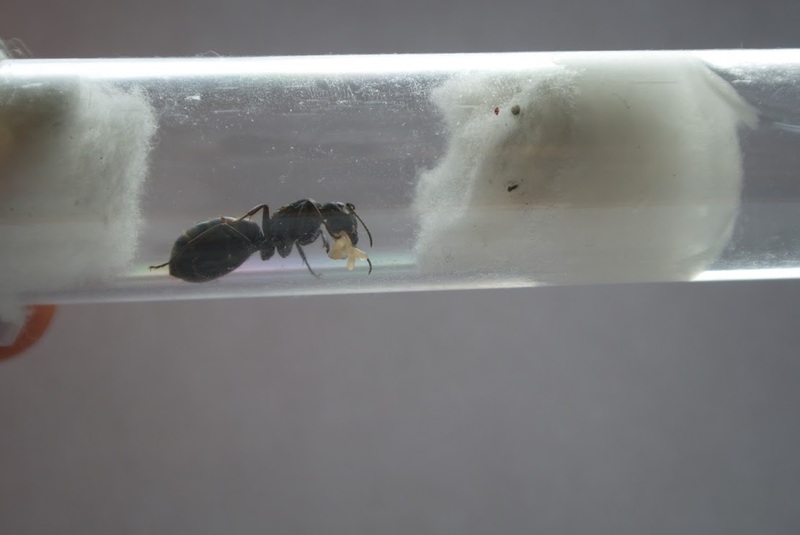 Recently, on another thread, I've been discussing how Queen #2 had moved her brood into the tube that connects that outworld to the test tube. You can read it here: http://forum.AntsCanada.com/viewtopic.php?p=29827#p29827. This morning, we woke up to find that Queen #2 has fully moved out of the founding chamber and has made a home under the piece of wood in her foraging area. We've taken the opportunity to replace her old test tube even though there was only a little bit of yellowing and mold. It didn't seem completely bad but there must've been something about that she didn't like. We're wondering if it was too cold? Maybe we'll set the test tube atop a small towel, now, to help insulate it. For now, we've decided to leave her be. If she moves into the new test tube that would be great. If she doesn't, oh well. I considered removing the piece of wood, but ultimately, we really don't want to disturb her and force her to do anything. Would anyone know of any pros/cons of letting her live in the outworld? Here is Queen #1 and her brood at its current stage. I apologize for the grainy iPhone quality. I was too lazy to use the DSLR. She has three workers, two pupae and about 7-8 eggs and larvae. They have used the crumbled pieces of baby powder/rubbing alcohol that have fallen from the barrier to create a barricade. 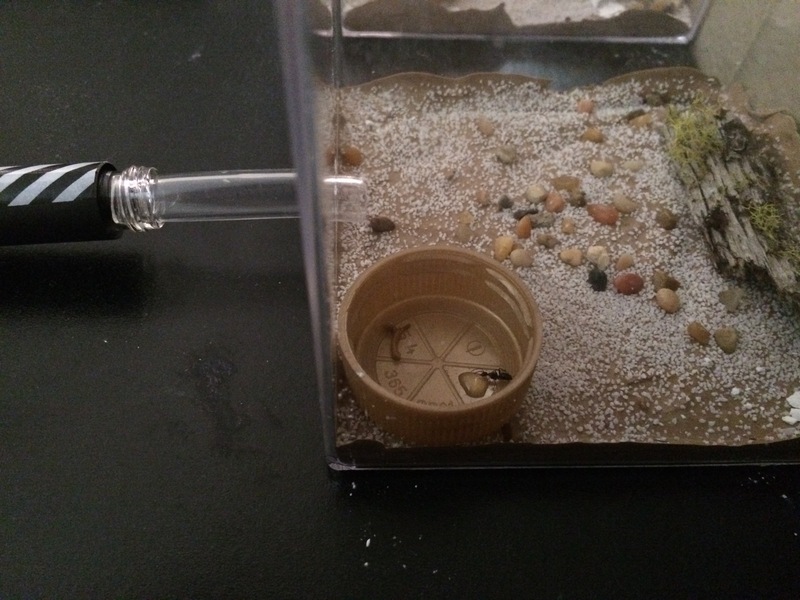 We've been debating whether or not to remove it and give them a bit of loose sand to use instead. Queen #3 is also a C. modoc. She was found roaming around inside our house, about week after we found the other two. So far, she is the "runt" of the three. Her eggs only pupated about a week ago. She spends most of her time staying directly over them. 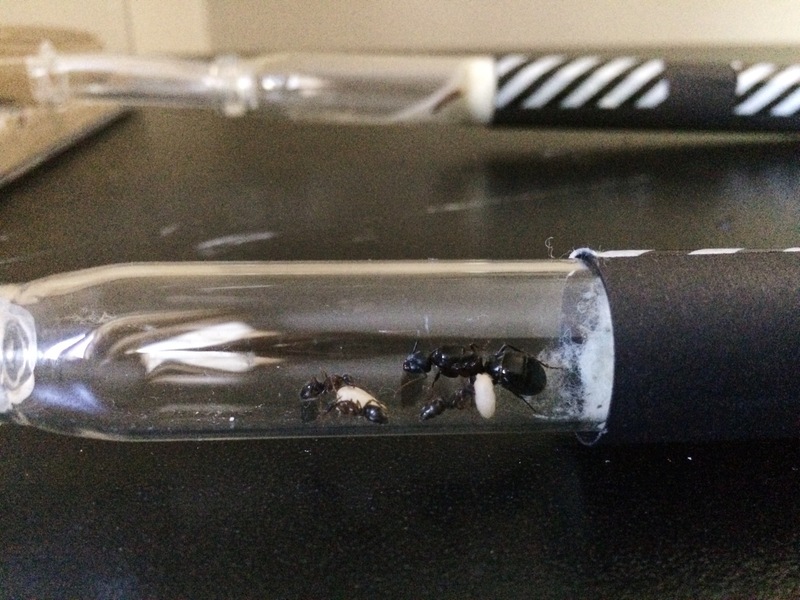 In our very first journal post, I realized that I had accidentally written that Queen #3's eggs had pupated but in fact, they had only become larvae. 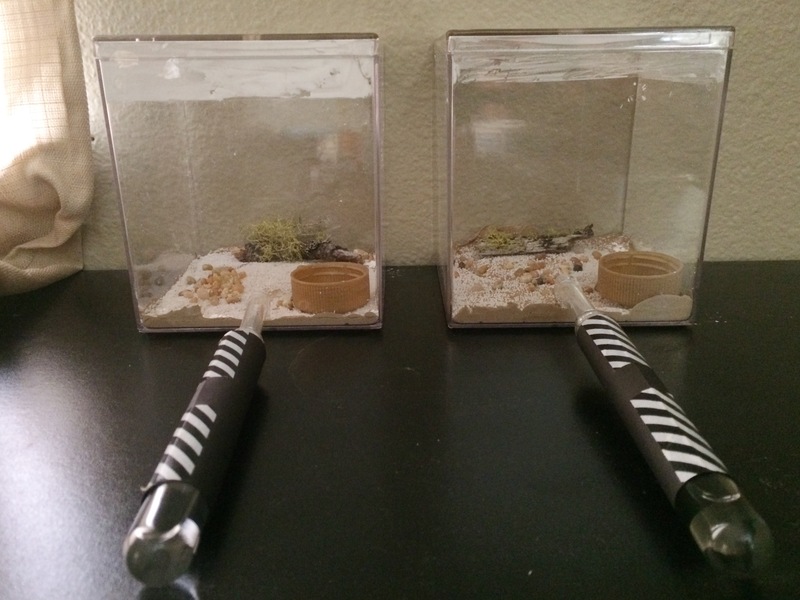 It has already been almost a month and they still haven't pupated yet.